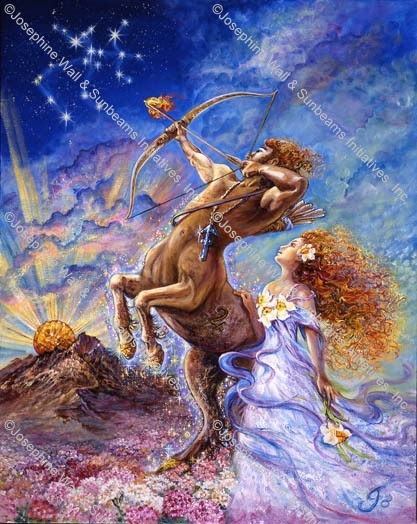 Sagittarians are energetic and naturally outgoing, achieving each goal through positive thinking. These "archers" seek knowledge and wisdom and never tire of the quest for what is yet to come. Challenges keep a Sagittarian's spirit thriving, and once met, a target is set for the next goal, and the next. Astrologers believe that being born under this fire sign gives Sagittarians the gift of providence - that luck protects them. Under the jovial rule of Jupiter, they make for charming and agreeable companions. Their key phrase is "I see." Never dwelling on what has happened today, a Sagittarian constantly believes that something wonderful will happen tomorrow. Sagittarians have such a zest for life that they make you want to hang on with them and enjoy the ride.